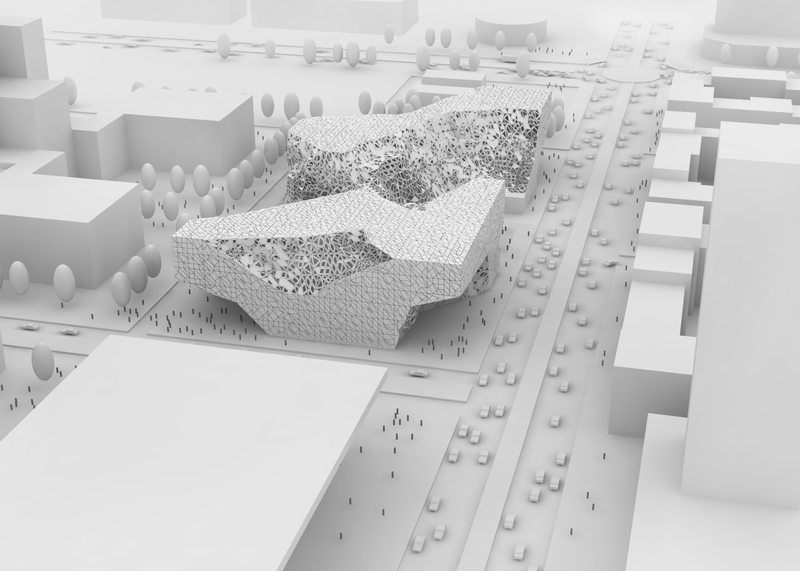 The last part of the Warsaw Cultural Centre (WCC) project was about an urban scale model in 1:1000 scale. Its purpose was to show all crucial relations between the WCC and its direct surrounding. Project site plays important role in the city structure of Warsaw by being transportation and commercial hub. Thus it was necessary to take all this isseus into consideration and measure it by numeric parameters, what was later used for project generation. The picture below presents part of the city, which would be highly influenced by the project and that is why it was chosen to be finally modelled. 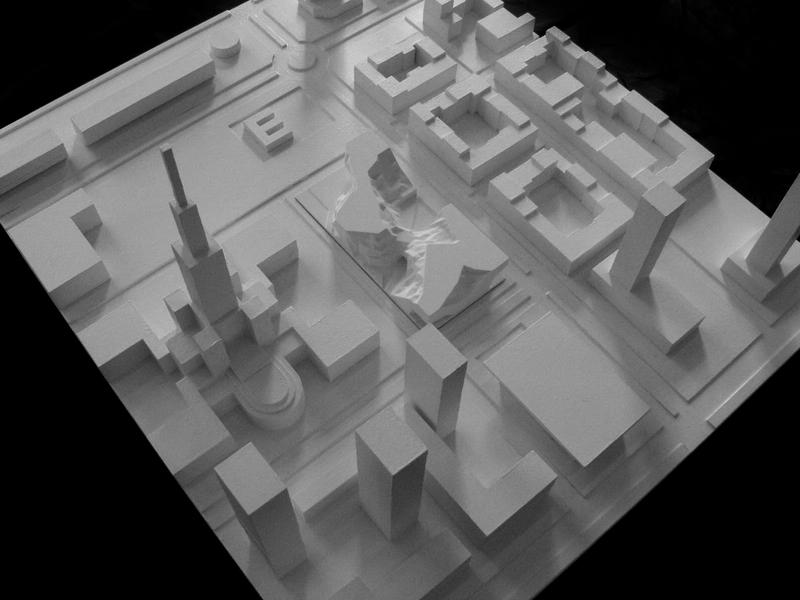 The urban scale model consists of two parts, which vary in terms of its status and a fabrication technique. The first part represents a piece of Warsaw city centre in the form it will look like in the next 3 years, meaning it shows also projects which are now under construction. It was laser cut in many layers and at the end put together. Warsw Cultural Centre was the second part of the model. The form of the project was created by using 3D printed technique. 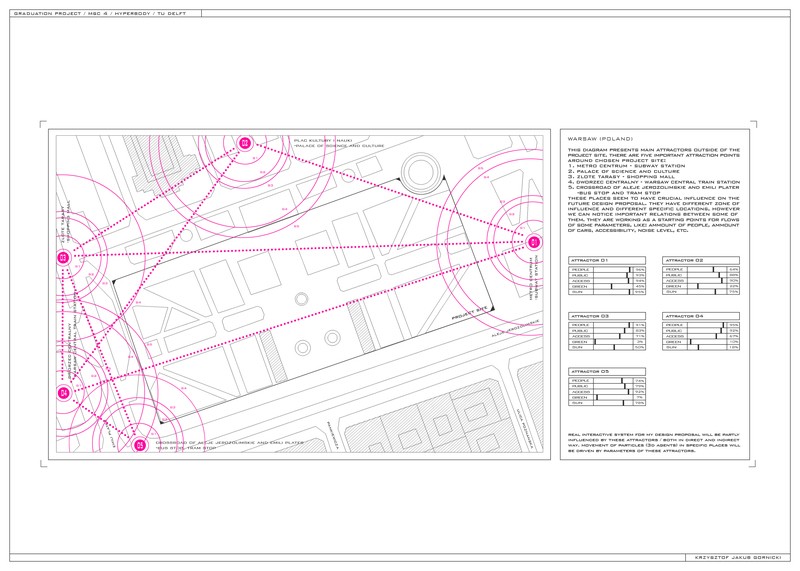 The main purpose of Warsaw Cultural Centre (WCC) project was to prove that computational approach can lead the design till final materialization in a much faster and effective way. Thus part of the WCC form was chosen to be finally fabricated in 1:25 scale. For this purpose scrpit was written in VB Rhino Script to generate all the elements of the project. The construction method was slightly adjusted to the scale of the prototype (some elements would be to small if we use 1:1 scale procedure), however in full scale process it will follow exactly the same logic and the script will need minor changes. The picture above shows the part chosen for fabrication, including all the elements of the structure and cladding system. The movie below presents a process of generating all these elements by a couple of rhinoscripts. In a first part simple fugures are selected, and then based on their geometry the final form of the prototype is created. Two CNC techniques were used to create final prototype. Construction beams, floor plates and joints were cut using laser cuting. A seperate script was written to unfold all the surfaces and prepare files for the laser cutting machine. 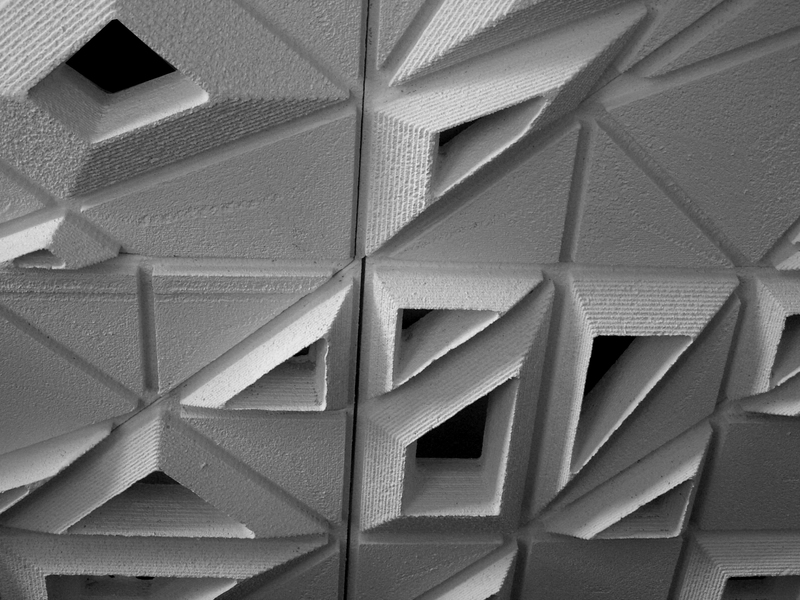 On the other hand cladding panels were formed by using CNC 3 axis milling machine. The prototype, consisting of more then two thousands elements was cut and milled in 74 hours and was assembled in 22 hours. 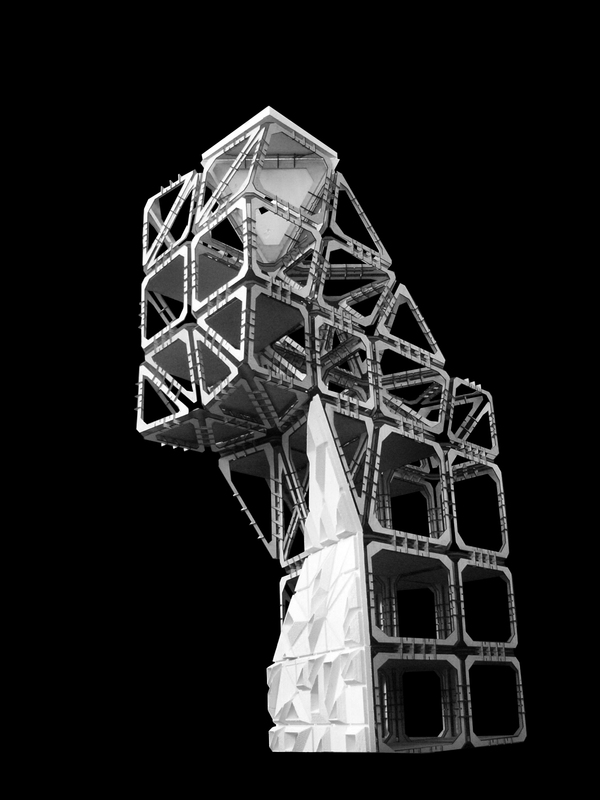 Project construction method was first developed and tested on Interwoven System Project, which was a graduation research project at the TU Delft in the Hyperbody studio (posted on the website a couple of months ago). 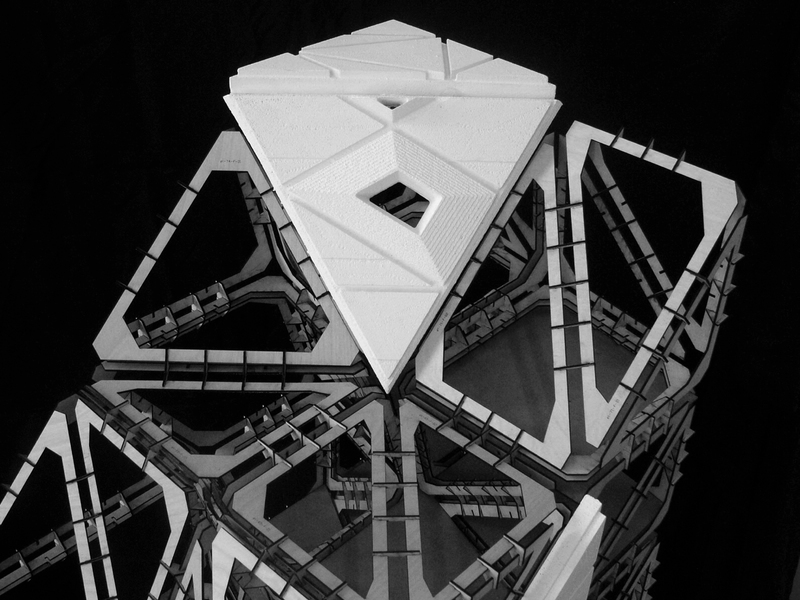 Warsaw Cultural Centre was a graduation project at the TU Delft in the Hyperbody studio. The project was developed under tutorship of dr. Nimish Biloria, dr. ing. Henriette Biere and Martin Sobota. I would like thank them for all the help. Plac Defilad is a main square in the city centre of Warsaw and despite of the fact that it seems to be the most interesting and valuable place for urban development it still stays almost empty. There have been lots of discussions about its future appearance, and many urban plans were made. However none of these investigations were finally accepted and still there is no clear decision how Plac Defilad should look like in the next ten or twenty years. The design task was to propose a new, alternative solution for Warsaw’s city centre. It needed to be multifunctional project, consisting of cultural, business and commercial activities. The big challenge was also to integrate all different transportation facilities and create here real social hub. 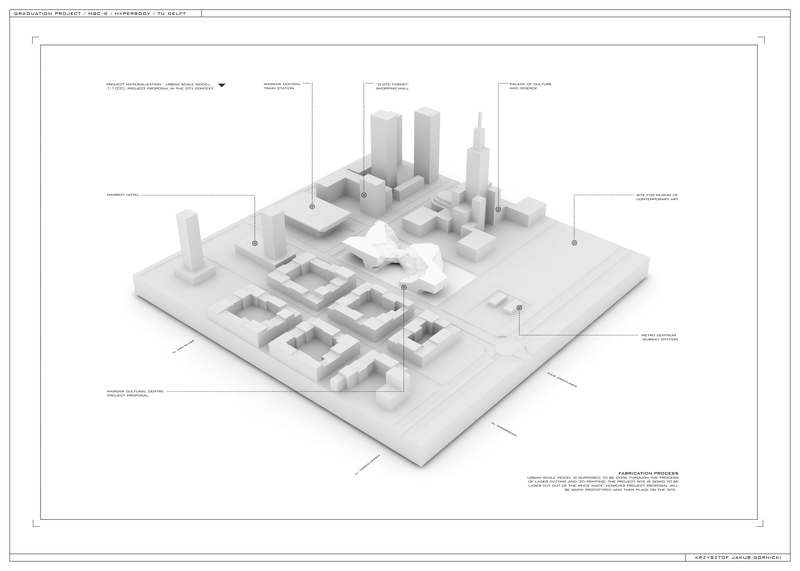 The idea of the project derives directly from the urban structure of the city of Warsaw. The site and its surrounding was fully destroyed during the second world war and it is still full of undeveloped areas and empty lots of land. There is a lack of proper city structure with a geometry of streets and squares. Thus the form of project starts from a ‘bounding box’ of the site, including all the city regulations. Then this box is gradually eaten away at, based on the site characteristics and parameters. It gave a final form which in some places still kept box geometry, nicely filling the gap in the city. However functional configuration inside follows geometries from the site analysis program and is not constrained by the outer bounding box. 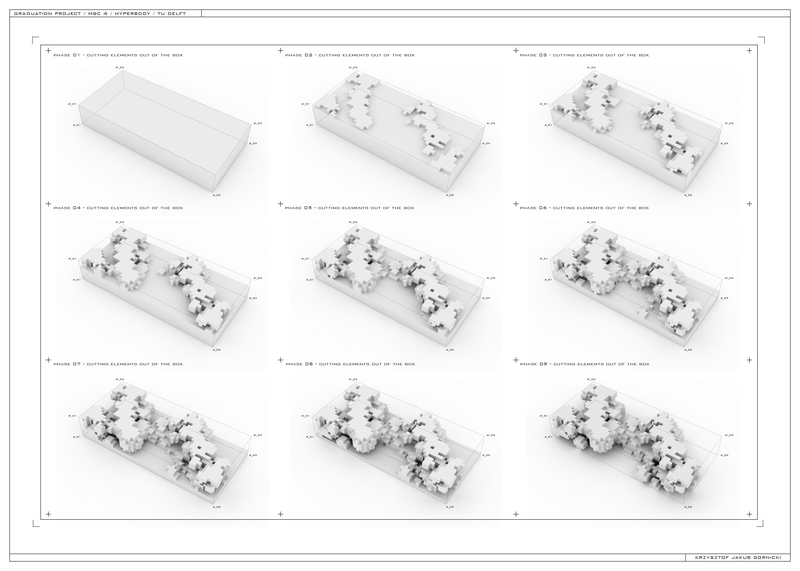 The purpose of the WCC project was to show how computational techniques can be used on different design stages, starting from conceptual sketches and finishing with preparing files for materialization. The crucial point was to introduce them not as one ‘master’ tool, which solves all the problems, but as a set of small interconnected programs solving separately specific issues. In that case that was always possible to rethink all the decisions and create feed-back loops to find optimal solutions. The design process started from a site analysis and the first functional diagrams. For this purpose computational procedure was written in Processing language. The result of that was briefly describing project geometry and providing internal communication plan. 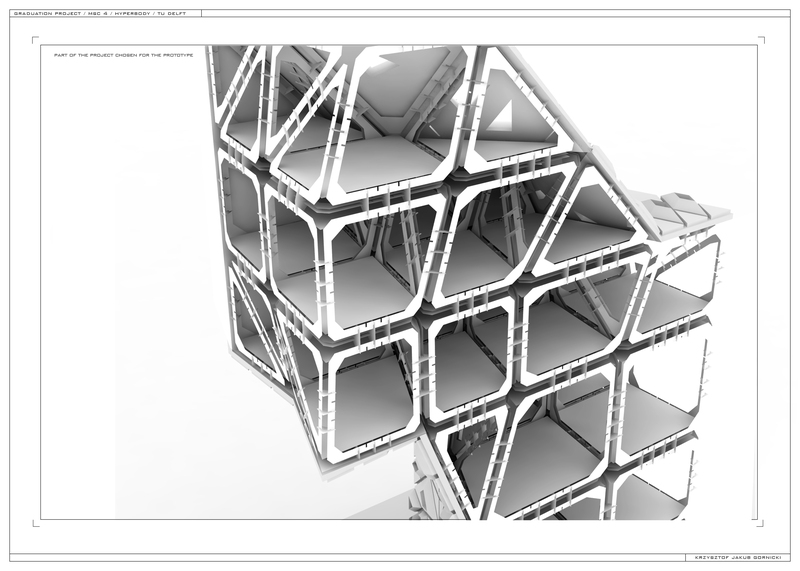 On that base in the next step a couple of scripts (Rhino VB scripts) were used to generate exact geometry of the project and develop parametric skin components, which were able to be driven by all gathered information. Another important part was to introduce a tool to create customized and unique structural strategy for the project. In that sense construction methods were following design ideas, not another way around. In the last part of the project separate code was written to generate files for final materialization. Produced prototype in 1:25 scale was fabricated by using CNC techniques like laser cutting and 3-axis milling machine. More information about the fabrication process and final appearance of the prototype will be posted soon.